Sacramento Country Day School, founded in 1964, is the leading independent school in the greater Sacramento region. Located in a leafy suburb just outside the urban core of Sacramento, the school embraces the ideals of a liberal arts education. We encourage our students to develop the full range of their capabilities – intellectual, physical, creative, social, and moral, and we cultivate in them the habits and skills that will enable them to lead fulfilling lives. A hallmark of Country Day is the close mentoring relationship that develops between students and teachers, and with a student-teacher ratio of 9:1, every child has a “front-row” seat. All of our graduates are accepted to four-year colleges and universities and many attend some of the most selective in the nation. In addition, our warm, nurturing environment promotes deep and lasting friendships among our students, faculty, alumni, and their families. The Makerspace at Sacramento Country Day School shares a classroom with the seventh grade science class. We are able to use the tables, cabinets, and countertops to spread out at the end of the day. Our supplies are stored in bins in the cabinets and must be put away at the end of the class. The several sinks in the classroom have been put to good use both cleaning up messes and creating them. The classroom also faces out onto the middle school quad which has been important for providing a space to test many of the creations that come out of the makerspace, most notably bottle rockets, Coke and Mentos explosions, and any number of rolling carts and boards. 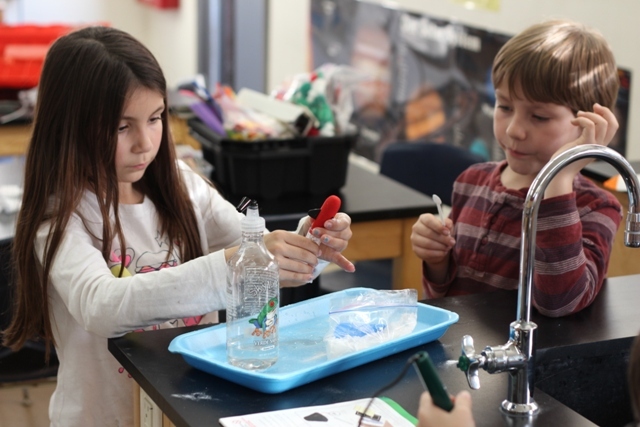 Two students play with vinegar and baking soda rocket. The Makerspace is run as an afterschool program. It is open to second grade through middle school, although there are a few high school students who drop in as well. There is no curriculum and all projects are student-initiated and student-directed. The teacher is there to help students learn how to use the tools, brainstorm with them when they get stuck, lend a hand when necessary, and ensure things are running smoothly. Currently we meet for an hour and a half one afternoon a week. Students are encouraged to work on projects over multiple days, but oftentimes they create something to take home within the hour-and-a-half long period. There is a large variety of supplies available to the students. From craft kits, to craft supplies, to hand tools, to wood scraps. Many of the supplies are donated by parents while the school supplies consumable materials like duct tape, glue, and paint. Students must receive a tutorial in how to use any of the tools in the space, but are then free to use them as they are comfortable. Our most popular materials are the recycled materials- cardboard, plastic, styrofoam, and wood scraps. The next most popular have been hot glue and sewing machines. Many of the students have tried their hands at learning how to use the sewing machines for a variety of projects including making clothes and sewing pieces to use with other projects. The hot glue is used in all kinds of projects from building cardboard houses to attaching piece of wood in sculptures. The last day before winter break the kids were asked to try the marshmallow challenge (building with marshmallows and spaghetti noodles) before moving on to their projects. Each day there is one table with some sort of provocation set up for kids who are between projects, are having trouble finding something new to make, or have trouble managing their time in the makerspace. These provocations have ranged from exploring buoyancy to SnapCircuits to wooden models. We also had a Slime Kitchen where the students were given recipes and ingredients to make a large variety of slimes, gaks, and play dough. This was incredibly popular and we will do it again this spring. We would like to branch out into both the library and the classrooms. It would be nice to coordinate with the teachers to integrate making into their curriculum. Mobile Makerspace carts have been discussed as a way to bring the Makerspace into the classroom instead of having the kids come to a designated classroom. We may also create a makerspace elective for the middle school. It has been hard to get middle school students into the space because it competes with homework, sports, and other after school commitments.